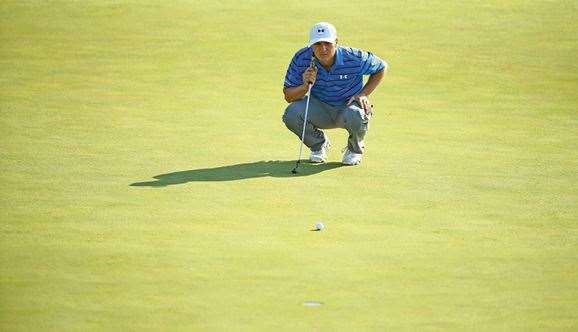 World No.1 Jordan Spieth reveals his processes for holing putts when the heat is on. Jordan Spieth is one of the best putters in the world. He misses putts like all of us but he has developed a system to help him put under pressure … and the proof that it works is in his results. “This year was fantastic for putting in big stages and I really found a couple of ways to cope mentally with the added pressure,” the World No.1 said, “especially on shorter putts and putts that I have to have a tendency, whether to leave the face open or what not and I did part of that by looking at the hole, I did part of it by lining the ball up, it just depended on where it was. “I just kind of discovered these techniques on what I felt worked for me on my own. When I line it up, I look at a piece of grass, specific piece of grass just in front of the ball. It works much better than me looking right at the ball when I’m nervous.